WASHINGTON — Orbital ATK’s plans to resume cargo flights to the International Space Station, using both an existing launch vehicle and an upgraded version of its own Antares rocket, face risks that could delay those missions, according to a new report. The Sept. 17 report by NASA’s Office of Inspector General (OIG), reviewing NASA’s response to the October 2014 loss of a Cygnus cargo spacecraft, also found that the agency missed opportunities to seek savings in its contract with Orbital ATK before and after the accident, costing it more than $80 million. Orbital ATK’s current plans call for carrying out four Cygnus flights through the end of 2016. Two, in December and March, will launch from Cape Canaveral, Florida, on Atlas 5 rockets Orbital is purchasing from United Launch Alliance. Two others will launch later in 2016 from Virginia on a new version of Orbital’s own Antares, replacing the original AJ-26 engines in its first stage with RD-181 engines from Russia’s NPO Energomash. The report, though, warned that schedule may be too ambitious. “We found that Orbital’s Return to Flight Plan contains technical and operational risks and may be difficult to execute as designed and on the timetable proposed,” the report states. That concern is based on both the use of the Atlas 5 and the upgrades to the Antares. Integrating the Cygnus with the Atlas 5 is a “credible solution,” the report argued, but doing so relatively quickly runs the risk of problems that could delay the mission. A bigger issue is replacing the Antares’ first stage engine, which requires other changes to the vehicle. “The extent of these modifications, coupled with Orbital’s aggressive launch schedule, will limit the time available to conduct qualification testing of the new engines and other components,” the report warned. Orbital, the report stated, has no plans to perform a demonstration mission prior to launching a Cygnus. Company officials note that both integration of the Cygnus with the Atlas 5 and upgrades to Antares remain on track. 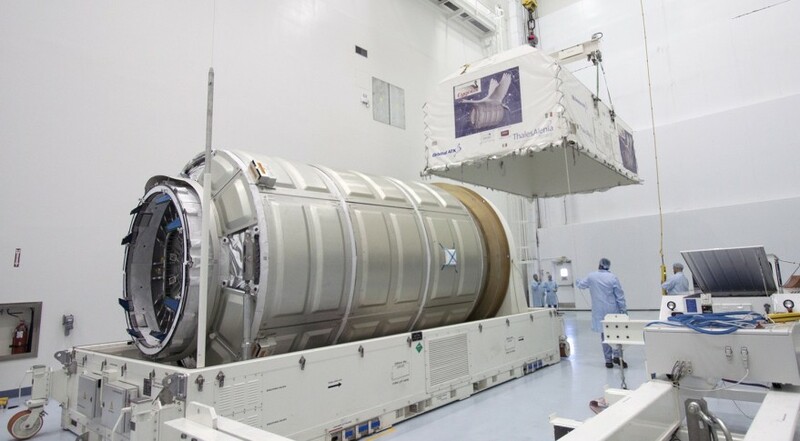 Orbital ATK spokeswoman Sean Wilson said Sept. 17 that the work on an early December launch “is moving along on schedule,” with the cargo module of the Cygnus already in Florida. Mark Pieczynski, vice president of strategy and business development for Orbital ATK’s Flight Systems Group, said at a conference Sept. 1 that the “initial launch capability” for the re-engined Antares is on schedule for March 2016. However, company officials said then that the rocket’s return to flight could be delayed by the manifest of other cargo missions to the ISS. The OIG report also criticized NASA for not taking steps both before and after the October accident to reduce its costs under the Commercial Resupply Services contract it has with Orbital ATK. NASA did not take advantage of a contract provision that allowed it to renegotiate the price of the first two cargo missions when they were delayed from 2011 and 2012 to 2014. Had NASA done so, it would have saved $21 million. Instead, Orbital offered “other considerations,” such as analyses and minor spacecraft modifications, which NASA valued at only $2 million. When Orbital developed its return to flight plan after the Orb-3 accident, it elected to eliminate one cargo mission, distributing the cargo it would have carried on the four other missions remaining on the original contract. NASA accepted an Orbital proposal to take the price of that canceled mission, divided by the mass of the cargo it would have carried, as the way to transfer its value to those other missions. The OIG report found that NASA could have instead used a lower per-kilogram price specified in the contract to handle that change. “We calculated that doing this could have saved NASA up to $65 million – funds that we believe could have been put to better use,” the report stated. The report did not take issue with the overall structure of the contract, where NASA pays most of the money for each mission prior to launch. “This is not unusual for government contracts relating to space operations given the expense and risks involved in spaceflight and the limited number of capable contractors,” it stated. Counting payments for the failed mission and early payments for two missions since added to the original contract, NASA has paid Orbital ATK $1.6 billion to date.